First Novels Club: Eyes in the Mirror Review! So, ever read and book and get like 20 pages in and then something happens that you not only didn't expect, but it actually makes you put the book down and say, "Wait, WHAT?" Yeah, that happened to me with EYES IN THE MIRROR by Julia Mayer. "Every teen girl fantasizes about having a double and best friend rolled into one-an alter ego with whom she can trade places, allowing her to disappear. Samara is a troubled and lonely adolescent, prone to cutting, who desperately craves both intimacy and escape from her unfulfilled life...until she meets her reflection, Dee, the seeming answer to all her problems." I thought this book was going to be a psychological journey through Samara's world. And it was, but in a way I totally didn't expect. I thought Dee was going to be a mental manifestation of what Samara wanted her life to be. 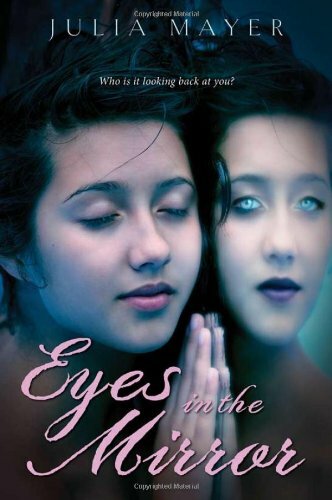 But about 20 pages in, the book took a paranormal turn and it turned out that Dee was not only a mental manifestation, but a physical one too, and the mirror that both girls looked into wasn't just a mirror, but more like a magical looking glass from Alice in Wonderland. The rest of the book follows Dee & Samara in alternating narrative chapters, showing the reader what life is like on both sides of the mirror, and showing Dee and Samara that life is never simple. What I think I enjoyed most about this book is the unexpected twists and turns that kept coming through the narrative. After finding out about the looking glass twist, I thought the book was going to go in the direction of each girl finding escape in the other's life, and it was going to be a much lighter book than I originally expected. But that wasn't true at all--and I liked that. Mayer didn't shy away from tough issues that are so prevalent in the teen world, because that's what made this book feel authentic. The other thing that impressed me about this book was to find out that that the author was a teenager when she wrote the first draft of this book! I always find this impressive for two reasons. First of all, I remember all of my attempts as a teenage to write a book-length piece of writing. How I would sit down at the computer and think, "I'm going to write a book about wizards! And princesses! And a magic ring! And it will be 500 pages and AWESOME!" but then I never got past page 30 or so before I got bored and started to do something else. Or, I finished something, thought it was perfect, and then never looked at it or did anything with it again. So to see a writer who, as a teenager, successfully completed a novel, then had the ability to revise it and continue to work on her craft, and see it through as far as it could go (in this case, to publication!) is always awesome for me. I think Eyes in the Mirror is worth checking out if you like books that don't shy away from hard topics, like Laurie Halse Anderson's, or if you like a paranormal edge to your contemporary novels. It's out from Sourcebooks Fire now! Go check it out! Wow the author was a teenager when she started it? That's awesome and impressive! The cover is incredibly creepy I like it. I also enjoy when a book has twists you don't see coming. I'll have to check this one out. Great review! Thank you for your summary. I just hit about page 20 and had to Google the book to see what I was reading. Now it makes sense. Looking forward to reading the rest! I love this book. I cant put it down. I got a little confused but now I understand.